It's smart and easy. What a way to make extra cash, recycle your items, and shop with awesome savings! We accept items that are under a year old, in excellent condition, and preferably good brand names. We take items on Monday, Tuesday, and Wednesdays. We accept items by season. Bridal and evening wear will remain for sale in the store for up to 6 months. Once the item is sold, you collect 50% of its final selling price. If your item does not sell after this period, you will be called by phone to come and collect the item. We also give 50% for other types of items that we can price at $150.00 or more! (purse, jewelry, shoes etc.). Other items will stay for approximately 2-3 months. Once the item is sold, you collect 40% of its final selling price. We put items on sale for as long as we can after 2 months. If the item doesn't sell within it’s given time period, it will be donated to a charity. Discounts on items and periodic store-wide sales are at Play It Again Val's discretion. We discount 25% after 1 month, and 50% after 2 months. At the end of the season, expired items may be sold for an 80% discount. 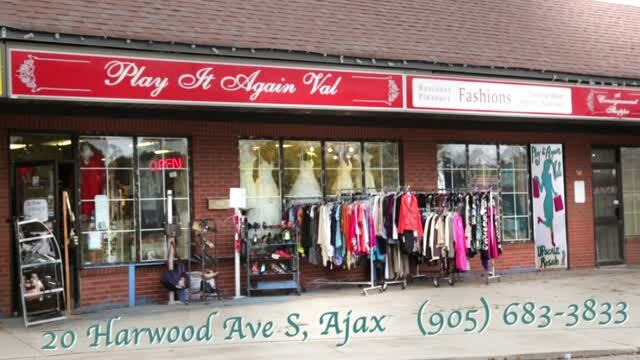 “Payouts” to you when we sell your item(s) are made by cash or cheque, or sometimes a debit card/credit card refund. It is your responsibility to monitor the status of your account either by phone or in person. Play It Again Val is not responsible for damaged, lost, or stolen items. Play It Again Val has the right to donate items (besides bridal) if a flaw is found during processing. If you would like your unsold items returned to you before they are donated, it is your responsibility to come to the shop and find the items on the racks before the expiry date. If you find them you then bring them to our front counter to remove from our system. The staff of Play It Again Val cannot gather unsold items for you.